Chris, I am pretty sure I can speak for many of your followers that we are wondering if all is okay. We have been missing your shows and hope to hear from you soon. A wealth of advice and knowledge for any scouter. Thank You Cubmaster Chris for sharing your wealth of knowledge to us. I am a Den Leader of Tiger Cubs here in Sam Houston Council. Just started listening to you last week and I'm hooked. I am learning alot and taking notes from your podcasts. I hope to be there for my son and the boys in my den for a long time. Hopefully to see them be Webelos. Thanks again for teaching us the way. Recommended to any Cub Scout Leader, from Cubmasters to Den Leaders. Cubmaster Chris has over a decade's experience in the program and it shows in every episode. The show is a caffeine shot to the weary volunteer who needs that extra boost of enthusiasm from time to time. A great resource for ideas and insight. Two "signs-up"! My husband and I took over our local pack this fall (he's the Cubmaster, I'm the Committee Chair). We had next to no experience with Scouting and went from 10 boys last year to over 30 now. Needless to say, we were overwhelmed. There's not enough time in the day to read everything I need to, so this podcast is great. I can listen just about anywhere -- but I now make sure I have a notepad with me so I can write down all the great ideas and research them at a later time! Thanks Cubmaster Chris! I especially loved the advice that the parents who are asking lots of questions, are the parents we can probably recruit to help. I love to listen while I clean the house, however I always end up running to the computer or our scout room to find something Chris is talking about to use at our next Pack or Den meeting. Thanks for all the great information!!!! I found this podcast about a month ago, and have downloaded as many as I could find - and listened to them in two sittings - about 14 hours or so. I love listening to Chris as he brings great ideas to mind. Some of these he says are old standards, but apparently no one in our troop knows about these things. I am Asst. Cubmaster and am VERY excited to use some of these "recipes" in our Pack. Also, I appreciate the ideas for running the pack, and recruiting parents and so forth. Great Stuff! You need to listen to this show if you have a scout. Its all in the comment - there is a treasure trove of incredibly useful cub scouting information. This is a great resource for new cub scout leaders. As a new den leader and new to scouting, I really appreciate all of the information, tips, explanations, ideas and suggestions. Thank you Chris for all if your time and effort. Good: Covers Cub Scout topics, is timely, shares cub scout round table topics. An excellent resource. The banter between guests is usually fun and illuminating. Sometimes hosts/banter can run on a bit, but on the whole an excellent resource for new cub leaders wanting to know whats going on or experienced leaders wanting insight in to what's new from BSA or ideas on how to really make your program fun and meaningful for the boys. Keep up the good work! Be the best informed Cub Scout Leader on your block, maybe even the whole neighborhood! I have listened to Cubmaster Chris' podcast for over a year now and I find that he presents ideas that help make a great den or pack meeting. With the relationships he has built with other scouters, he presents timely information often months before I hear it at Roundtable. If you want to be a Cub Scouting Know-it-all you simply MUST get your information from the Hour A Week podcast! This podcast is great. It's the one place to go to get scouting information from real scouters. You get the good the bad and the ugly, not just the good from this podcast. Thank you for this podcast it has been a great help while ramping up into my new position from Cubmaster to Committee Chair. An Amazing Podcast - Don’t Miss Out! If you are involved in a cub scout pack, do yourself a favor and click “subscribe now”. Cubmaster Chris is an extremely knowledgeable host who is easy to listen to and is bursting with enthusiasm and great advice. The production quality of the podcast is top-notch. If you are new to cub scouting, this podcast is chock full of information that will help you deliver a great program for your boys. If you are seasoned scouter, this podcast will help to reinvigorate and motivate you. It is the flagship for an entire community of passionate scouters. Thank you Cubmaster Chris for helping me to become a better leader! Cubmaster Chris, great show! I've used many of your ideas at both the Den and Pack level, and they have always been a big hit. I encourage all Cub Scout leaders to listen in! Keep up the good work! I started listening earlier this year and haven't stopped. The show is informative and Chris is a good host. As a CS leader, I am always looking for ways to help make the program we provide better. Keep up the great work and I can't wait to get into the training discussion this summer! This is a great podcast giving lots of help and helpful ideas to scout leaders everywhere! I found this podcast about a year ago while researching my new role as a Cubmaster. As I was new to anything Scouting the information gleamed from this show has been invaluable. Thank you and keep up the good work. Chris does a great job and I've really enjoyed listening. He always has scouting news, topics, and ideas that are relevant to what I'm trying to do with my own cub scout pack. While sometime, chris seems to stray from scouting topics (including lots of personal life info), he is for the most part on point with lots of reactions and opinions about running a cub scout program. I've sent in several questions via e-mail and they have all been addressed on the show. I really enjoy the "non-official" tone of the show. You get an "in-the-trenches" point of view and a practical outlook on scouting programs. Keep up the great work! 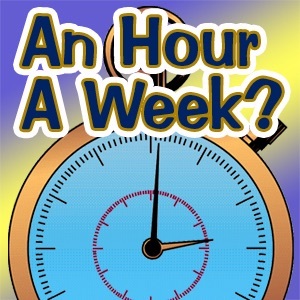 An Hour A Week is a fantastic podcast for anyone involved in Cub Scouts. I am a den leader and I find the show both entertaining and informative. Keep up the good work Cubmaster Chris! Very helpful! I have been a loyal listener for 5 years! This is an awesome podcast. I enjoy hearing how others do this "Game with a Purpose." It helps to know that the challenges I face have been faced and solved by others. I listen to them all! Trying to catch up on the few shows I missed. I really like listening to the show live from ptcmedia.net. Cubmaster Chris of the "An Hour a Week" podcast is a great resource for Cub Scout leaders and Scouters in general. This podcast was an aid and inspiration when I was a Cubmaster, and even now as a Boy Scout leader. His ideas on turning a Pack Meeting into a "show" and suggestions on doing this make it worth a listen. THis is my favorite Cub Scouting podcast. So much useful information. I would love to give it 5-Stars, but the host gets disctracted by the chat room to the point of being an annoyance at times. I guess it is a matter of whether the podcast is for the people in the chat or the people that listen later. This podcast should be required listening for all CS leaders!! Cubmaster Chris has built a solid podcast which is part autobiograpy, part advice column, and part Scout news show. The large community of listeners who take part in the online chat during the show add dimension and additional perspectives. Well worth an hour a week. Whether you're a parent, scouter or scout there's something to learn from Cubmaster Chris - always entertaining. Excellent podcast for new cub scout leaders and cub scout families! There are tips, tricks, ideas and info that will help steer you in the right direction, and it keep you informed about new ideas and plans from the BSA! Invaluable podcast! Great for both Cub Scout Leaders and Parents, the "An Hour A Week" podcast is as entertaining as it is informative. This podcast should be in every Scouters playlist. Thanks so much for putting this show together. I am the Cubmaster for a large Pack (about 120 boys) and have used ideas that I've gotten from AHAW on several occasions. Keep up the fantastic work! Great shows! You've come back with a bang after your brief summer break. Shows are tight and packed with lots of content and points to ponder. New website looks better than ever. Show notes and links are a great resource and tool! Keep up the great work & thanks from all of us cyber scouters out there. Somehow he packs in 2 hours of learning into an Hour a Week! This is an EXCELLENT resource for current leaders and parents involved in the pack. Like roundtable, this is one of those things that I truly help you to become a better scouter. Thanks Chris for the work you put towards the show. It really helps many more than could ever sign in to the chat room or even respond on here. I plan my Sunday evenings around this podcast. A must listen and even better follow live in the chat room. I am looking forward to the new and improved version comming next. Keep up the great work Chris. This podcast is extremely informational and a great listen. Chris - Thank you for taking the time to put this together. One day I'll catch the live show! I listen to Cubmaster Chris every week. I get a lot of good ideas and information from his podcast. I tell every Scouter that I meet about this podcast and the others from PTC Media. This podcasts should be required listening for all Scout Leaders. This is one show that brings together the how, what, who, and spirit of Cub Scouts. If you are an adult volunteer. Check this out. The info is by far more in-depth than anywhere else on the internet. All Scouters can gain from this PodCast, not just Cub Scouters! CubMaster Chris talks about beuing a district trainer, interacting with his son's Boy Scout Troop, being on the roundtable staff, and about being a CubMaster and parent! Great resource for all; I just wish I had learned of it earlier when I was a Den Leader!! Truly, this is the best, most informative, most down to earth podcast I've found. Whether you're a new leader looking for information or an old leader fishing for new ideas, this podcast is perfect for you. Cubmaster Chris does a great job with this podcast. Every episode has something that you can use whether for your den or for the way the pack is run. Occassionally there is a rant (as Chris calls it) but it is a great resource for any leader, especially if your new. I have learned a lot from Cubmaster Chris's podcast. It is helps to bring the scouting community closer together. PTC Media is Great! Sometimes you need to hear the concerns of another person who has a great running pack to know your not so far off the mark. He's almost convinced me to start my own podcasts. This should be ranked number one on Itunes. I've been listening since March and have gotten quite a few tips on what does (and doesn't) work. Cubmaster Chris draws on personal experience and a much more creative mind than mine to make things interesting for the Scouts. He has given me several ideas to implement as I stumble through Scouts as Den Leader for my second son. I wish you had been around when my 13 year-old was going through. Thanks for putting this out there. I just finished fumbled through my first year of Cubmaster, and recently discovered this show. Too bad I didnt find it sooner. The ideas are great and your experiences are educational and inspiring. I can't wait to utilize the many resources given out here for my pack meetings next year.